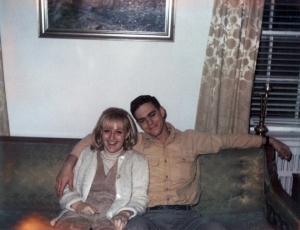 On Veteran’s Day, November 11, 1968, my husband departed for the Vietnam War. I was twenty-two and could not fathom that he might not return. That rainy Tuesday morning, fifty years ago, would be the last time I heard his voice. September 2018. I’m at an airport hotel in Atlanta, Georgia, where three giant, air conditioned buses are loading veterans and family members for a trip to the Infantry Museum at Fort Benning, Georgia, a US Army post where many trained for the infantry. I have a front seat, right behind the driver. Most people have boarded already but the seat next to me is still empty and it seems I’ll be traveling the one-hour plus journey without a seatmate. 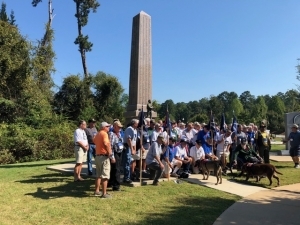 I know several veterans of the Vietnam Triple Deuce at this reunion of the 22thInfantry Regiment Society – especially the guys of A Company who served in Vietnam during ‘68 and ‘69. Cpt. 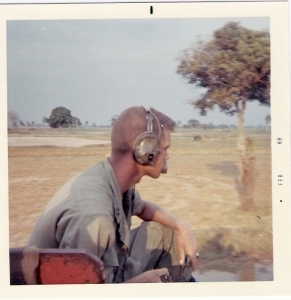 Dave Crocker, Vietnam War, 1969. They knew my husband, Captain David R. Crocker, Jr., as their beloved Company Commander. 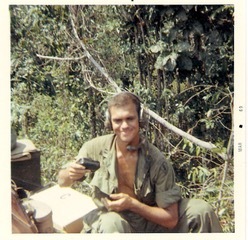 When he was killed in a booby-trapped Viet Cong bunker on May 17, 1969, the entire unit grieved and had to be taken from the field for several days. I didn’t know any of them until we met, by chance, in 2006 and they opened a window to our shared past. Since that first reunion in Omaha, I’ve met them at reunions around the country every eighteen months. More and more veterans of the Triple Deuce come each time as they situate their courage to reconnect with others who are their long-lost brothers. They have become my family, too. Their stories about my husband’s courage, leadership, and humanity towards them, during a horrific war, revealed to me the healing power of shared memories. Before the first reunion, I worried that I might not be able to handle the stories. 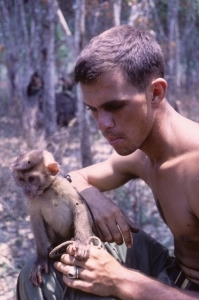 But hearing them became a tonic – a truth serum – that pierced the fog of confusion surrounding Dave’s final months on earth in the midst of jungle and heat in a dubious war thousands of miles away. A tall man suddenly boards the bus bound for the museum and sits down beside me. It’s difficult to discern his age. Perhaps he’s from a recent war. The Persian Gulf or Iraq. The history of the Regiment reaches back to wars from 1861. He opens a black leather portfolio with an impressive number of ballpoint pens neatly clipped inside. I’m not shy about starting conversations. “Have you been to reunions before this one?” I ask. When I told Joe who I was, he reeled back with a look of surprise – and then a broad smile. Joe and I spent the rest of the day together at the museum surrounded by all facets of war and weaponry going back to the American Revolution. On the bus tour of Fort Benning, I recalled battling giant June bugs in my first apartment as a nineteen-year-old Army wife. He laughed, describing the perils of jumping from parachute towers and jogging with a backpack full of bricks to stay in shape. We were bonded by our memories of Dave, of challenges of military life, and being able to dip back into the past without having to explain our roles in an era that remains inexplicable. We simply passed the talking stick back and forth between us and enjoyed the comfort of being with someone who understood. Back at the reunion hotel that evening, Joe found others from his unit of fifty years ago. I saw him across the room beaming as he slapped someone on the back in happy recognition. Once again, I was glad I had come to another reunion. I appreciate the consensus among these veterans of the courage it takes for each person to approach their memories. They are still helping each other survive. Their courage is contagious. I’ll be thinking about all of them this week as Veteran’s Day approaches for the fiftieth time since 1968. I’m grateful to them for helping me to find courage – and peace. 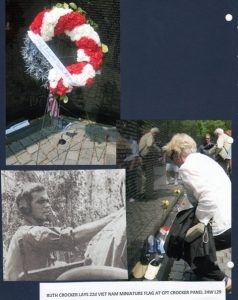 Ruth W. Crocker is the author of Those Who Remain: Remembrance and Reunion After War, a memoir of the Vietnam War. Visit www.ruthwcrocker.com for more information and to subscribe to periodic essays about war, peace and the writing process.